Warm Mineral Springs is a special place in my experience. I used to dive there and shoot video and cine for Sonny Cockrell, State Underwater Archaeologist with the Florida Division of Archives in the late 1970's and early 1980's. This site has bizarre geology, aquatic life such as it is, early man burial sites, fossilized remains, a hot springs spa and ironically, controversy on several levels. "During the Paleoindian Period (approximately 12,000 to 9,500 years ago) the Florida peninsula was very different from today. The sea level was much lower and the coastline much farther out. The climate in Florida during the Paleoindian period was cool and arid like an African savannah. Many of the lakes, springs, wetlands, and rivers in Sarasota County did not exist. Water was in short supply. This different kind of geography and climate meant a different array of animals and plants. Giants such as the mammoths and giant sloths roamed the grass prairies. Waterholes, such as Warm Mineral Springs, became vital to animals for drinking water in this dry environment. Humans also relied heavily on these few watering holes, not only for drinking water, but also for campsites where animals could be ambushed, butchered, and eaten. Evidence of these campsites is found today at the bottom of rivers, such as the Aucilla River in North Florida, and sinkholes, such as Warm Mineral Springs and Little Salt Springs in Sarasota County." "Archaeologist Wilburn "Sonny" Cockrell, 47, wouldn't know about that, but he can vouch for the spring's powers of preservation. Cockrell has made innumerable dives into the pitch-black, 230-foot depths and come back with a variety of ancient bones and fossils, including the remains of an 11,000-year-old Paleo-Indian hunter that he found on a ledge 40 feet down. Almost singlehanded, he has made the sinkhole one of the most significant underwater archaeological sites in the world. Like most such pools, Warm Mineral Springs was a cave until its ceiling fell in during the ice age 30,000 years ago. Unlike most others, though, it is fed daily with 20 million gallons of mineral-rich, 92-degree water that gurgles into it from an underground spring. Below a depth of 20 feet, the absence of oxygen and the presence of the minerals create a nearly perfect environment for preserving organic materials. " "In the late 1950s William Royal and other scuba divers found artifacts and human bones from at least seven individuals in Warm Mineral Springs. A partially burned log found in association with some of the human bones was radiocarbon dated to about 10,000 years ago. If the bones were the same age as the log, then the bones were the oldest known evidence of human occupation in Florida at the time. Bone artifacts recovered in association with the human bones were described as of "Archaic period in the Americas-type". The bones and artifacts were apparently deposited above the water level in the sinkhole at the time. One skull recovered from under sediment about 40 feet (12 m) under the present water level in the sinkhole contained organic matter. Hospital medical staff who examined the contents of the skull observed that it looked like a brain. One doctor reported that he could distinguish the cerebellum from pieces of the cerebrum. A section through the material also appeared to show grey and white matter. Tests were consistent with the material being brain matter, but no cellular structure could be observed. The property, which was privately owned, was developed into a spa in the 60s. Unrestricted access resulted in scuba divers removing human bones and artifacts and stalactites and stalagmites as souvenirs and for sale. 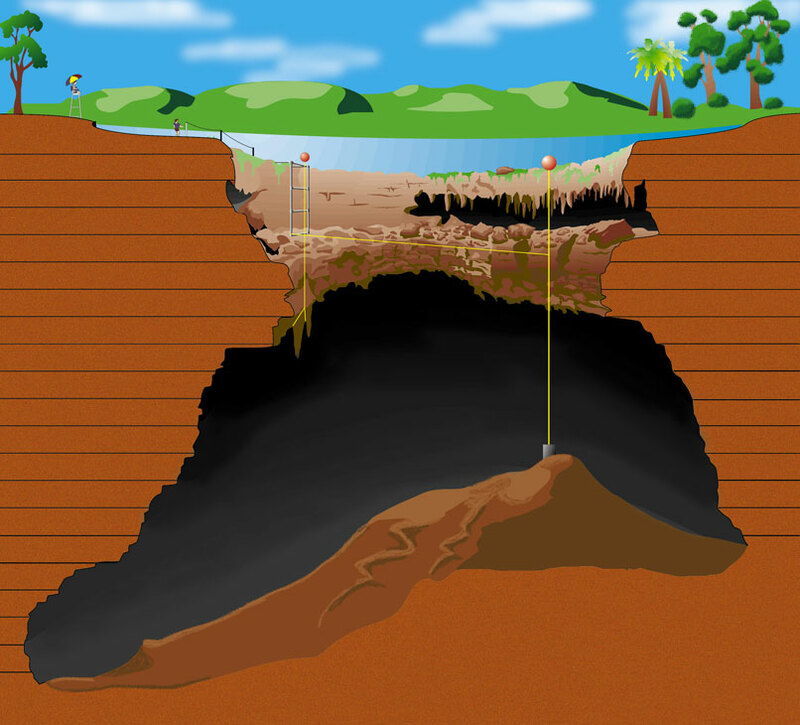 Almost all artifacts had been removed from the sinkhole before scientific exploration began. The property owners started restricting access to the sinkhole and trying to prevent looting and vandalism in the 1970s. Agencies that care for public property are required to inventory archaeological resources and to ensure their protection and preservation in the long term. They employ archeologists, part of whose job it is to catalog and curate artifacts found on that property. Landowners and those having permission to collect from the landowners are less constrained but not entirely free to do whatever they wish. Like endangered species, unmarked graves are protected by law and it is illegal to disturb them except under certain terms of various federal, state and local laws. Wilburn Cockrell, an archaeologist at Florida State University, starting working at Warm Mineral Springs in 1972. This work lead to the private owner's protecting the site due to its archaeological significance. Archaeological exploration of the sinkhole paused in 1975, resuming in 1984. Phase II of the project found evidence of tool making by early man. There is evidence of the Paleo-Indian and Archaic cultures. Wilburn Cockrell has described Warm Mineral Springs as the "burial ground" for the prehistoric residential community at nearby Little Salt Spring. In a 1988 interview Cockrell stated that the remains of more than 20 Paleoindians have been found in the sinkhole, including some radiocarbon dated to 12,000 years ago. The archaeologists also found bones of several Pleistocene animals, including a giant ground sloth, a saber-toothed cat, a horse, and a camelid. Cockrell found an 11,000 year old human skeleton in a fetal position, apparently placed in a crevice with broken stalactites holding it in place. This may be oldest known intentional burial in North America. In 1996-1997 a group of diver explorers conducted an underwater survey of the site resulting in the mapping of two warm water vents ~97 degrees F and two cool water vents ~76 degrees F. The group also video taped the site including the source of the deepest warm water vent at the end of a 150 ft. lone cave. Warm Mineral Springs was purchased on December 20, 2010, by Sarasota County and the city of North Port for $5.5 million." Really strange dive, particularly at the bottom circumference of the sink beneath the overhanging sidewalls. Passing by the ledge or relict "beach" shown in the illustration is pretty wierd too. There are long stalagtites around the circumference of the sink with caverns extending backward under the bank. A video overview of the past of this unusual archaeological site in Florida. It includes extensive diving footage from within the sink. 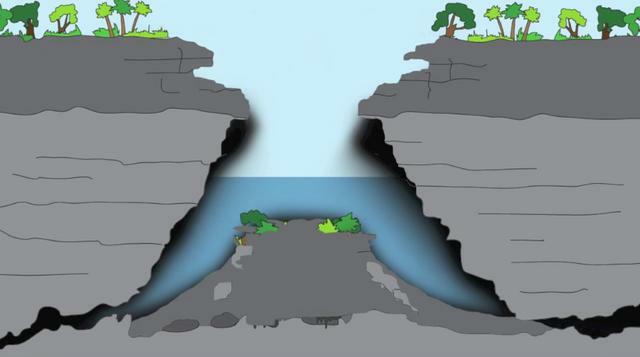 This is an artist's depiction of the spring during early man times with a much lower sea level. It must have been a startling sight, with steam coming out all over in cooler months from this craggy hole in the ground for pre-Columbian folk. A sectional diagram of the sinkhole, talus cone and relict beaches at depth. A dive in 1992 during particularly good visibility conditions and before the County took over the spring and banned diving there. A video of fairly recent free diving drop into the spring. The sulfur in the water contributes to the harsh green cast of the water. I understand the springs were closed to the public this year in some political debacle. Wonder if access will be restored or if this amazing site might be privatized for condo development? Things may have changed in the spring since it reopened. Curt Bowen a long time diver in the spring who also mapped the sink shot the following image today. This was shot looking upward from 145 ft. on the talus cone. Usually it is black as night around 125 ft. in my experience in the spring from the photochemical effect of the H2S in the water column. He said this only happens after several days of heavy rain. Also it was shot at noon when the photochemical effect is pretty severe. A remarkable image! Last edited by RickI; 05-16-2016 at 11:34 AM. I just learned the a good friend, W. A. "Sonny" Cockrell recently passed away. We shared a number of adventures back in the day. Looking for Columbus' Santa Maria off Cap Haitian, Haiti to numerous dives in the early man burial site in Warm Mineral Springs to exploring the wreck of the Gil Blas off Hillsboro Mile, visiting Plate Fleet sites off the east coast, discussing early man sites and shipwreck archaeology throughout Florida and the need for preservation and a good deal more. He had strong passion and convictions which came into conflict with some out there. When he was the State Underwater Archaeologist from 1972 to 1983, there was a major feud going on with some of the ship wreck salvors. He described multiple death threats he received including getting injected with air bubbles to simulate an air embolism. It was near open warfare for a while there or so it seemed. I recall Sonny used to routinely travel with gold coins on the way to the Division of Archives in Tallahassee. He also carried three guns usually to aid in self defense and that of the artifacts. He was a very intelligent, well read man with divergent interests. I recall he started in land based archaeology and ended up in underwater archaeology somewhat by accident. Sonny helps with core drilling on the barrier reef off Cap Haitien, Haiti looking for Columbus' Santa Maria in 1977. I remember the first time I met him when I was a freshman at USF in 1975. He gave a talk on cutting edge diving and UW archaeology techniques being employed at Warm Mineral Springs. Diver comlinks for communication with various experts on the surface during the dig, special monochrome video lights for better penetration of poor visibility in the spring and a good deal more. In the late 1970's we traveled to Warm Mineral Springs several times to shoot cine and still imagery of the underwater operation. I can recall one tour Sonny took me on the various significant parts of the spring, including all the sources down to 230 ft. in a rock overhead environment. The nitrogen narcosis became pretty intense at depth. I took a number of images in the excellent visibility that day with strobe illumination. Due to the sulfur content of the water and diurnal photochemical reactions visibility was often poor and light pretty much vanished to the blackness of night at around 125 ft.. It was a marvelous tour, I will find more of the photos and will post them here in time. One of the water sources for the spring in 230 ft.. Many years later I recall him describing solo dives working digs at 150 ft. on air into unstable silt of the talus cone at the center of Warm Mineral Springs. These dives were done in the need to make new finds in the spring without adequate budget for a support team in those later days. Sonny has a seat on top of the talus cone at around 150 ft..
We last met a few years ago when Sonny drove down to perform a GPR survey of some unmarked grave sites in graveyard in Ft. Lauderdale. It was good to meet for dinner and catchup on things. He was a driven, fascinating person and the world is a poorer place for his passing. Rest in peace Sonny. Last edited by RickI; 04-28-2015 at 09:46 PM. The USGS just came out with a publication on Warm Mineral Springs. The purpose and scope of this report is to provide a summary of retrospective studies (available from published reports and databases) pertaining to the geologic and hydro*logic setting of the region, and the water temperature, discharge, and water chemistry of Warm Mineral Springs. The study area includes Warm Mineral Springs and the Myakka River Basin (fig. 1A). Data were compiled from published sources from various agencies including the Florida Geological Survey, Sarasota County, Southwest Florida Water Management District (SWFWMD), and the U.S. Geological Survey (USGS). Data from the SWFWMD Regional Observa*tion Monitor-Well Program (ROMP), and other wells, were used to assess regional groundwater levels. The USGS in cooperation with the City of North Port and Sarasota County, Florida, conducted a study to review, sum*marize, and analyze existing data pertaining to Warm Mineral Springs. The retrospective summary addresses (1) the regional hydrologic and geologic setting, (2) anthropogenic effects such as water use, (3) sources of warm water, (4) discharge and water temperature, and (5) geochemistry and water qual*ity. The associated analyses are intended to provide informa*tion to local, regional, and State water-resource professionals to better understand and sustainably manage Warm Mineral Springs." Curt Bowen has assembled a good deal of excellent information on the spring, underwater imagery and the like at this website. He also shot this remarkable video in some particularly outstanding visibility at the spring in 2015.